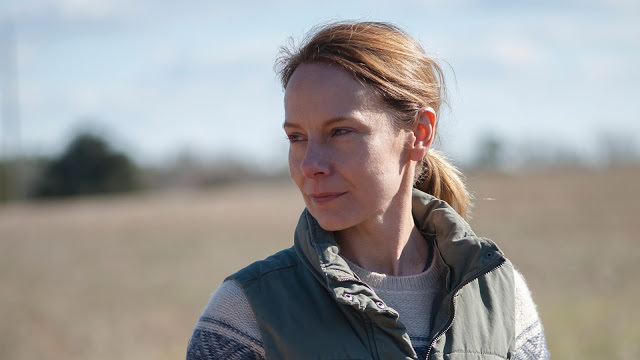 A week after Tracy (Amy Ryan) and Jesse (Terry Kinney) bury their father on the family tobacco farm, three strangers show up to make a claim on the land. MacLachlan’s deeply personal follow-up to 2014’s GOODBYE TO ALL THAT is an intimate meditation on grief and legacy. Tracy and Jesse see the visitors in a different light. To Tracy, the visitors are interlopers who have no right to her family’s farm. Nothing more than a nuisance, who she asks to leave in subtle and overt ways. Jesse, a man of faith, views this as a chance at redemption. A way to right a wrong in their families past. People react to death in all kinds of ways, and the death of a parent can be especially volatile. It isn’t uncommon for one person to feel a range of emotions in a single day while another remains in shock and disbelief. MacLachlan beautifully captures this dichotomy in the opening of ABUNDANT ACREAGE AVAILABLE. Tracy and Jesse argue over how to handle the burial in what builds to a tug of war over their late father’s remains. The two recognize the absurdity of the situation and start to laugh. Very few films can capture this aspect of grief in an organic way, but Ryan and Kinney encapsulate the moment with complete grace. Ryan, who is a standout amongst all working actors today, gives a staggering performance as Tracy. She plays her character with a quiet dignity, keeping her turmoil just beneath the surface. Kinney gives a career-best performance with his turn as Jesse. He plays a deeply religious man who all but ignores the wishes of his younger sibling. Played by a lesser actor the role could have come across as mean-spirited or hateful, but Kinney injects a sense of pain and regret that makes his character tragically human. While MacLachlan has written a fairly simple story he fills the piece with complex characters that require nuance in their execution. First and foremost ABUNDANT ACREAGE AVAILABLE is a performance piece. An adult-oriented drama that audiences are rarely given these days. Every aspect of this film and its execution are in support of the characters. The quite almost muted camera work allows for moments of subtle performance to shine. In a scene where two characters discuss birds flying overhead, the shot never breaks to show the creatures. We simply hear them flying past. In doing so we remain focused on the shared moment between these two because, in this film, that’s what really matters. ABUNDANT ACREAGE AVAILABLE is currently playing at Cinema Village in NYC. Click here for showtimes and tickets.